With up to an 86% success rate, patients have experienced dramatic pain relief and healing. Advanced Spine Care is only the second in Maine to offer this breakthrough treatment. 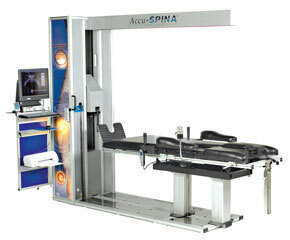 The Accu-SPINA system delivers IDD therapy treatment protocols that mimic many conventional physical therapy regimens. This precise, gentle, computer-controlled decompression treatment promotes the natural healing of herniated or degenerative discs by stimulating the hydration and renewal of damaged tissue. The treatment is not only safe, but also comfortable and relaxing. The course of therapy includes a series of treatment sessions that are completed in about 45 days (six weeks). Each procedure is performed by a certified clinician specializing in back and neck pain care. The treatment sessions are brief, lasting approximately 50 minutes.